The first time I came to Chiang Mai in 2010, I didn’t even know what Yi Peng was. 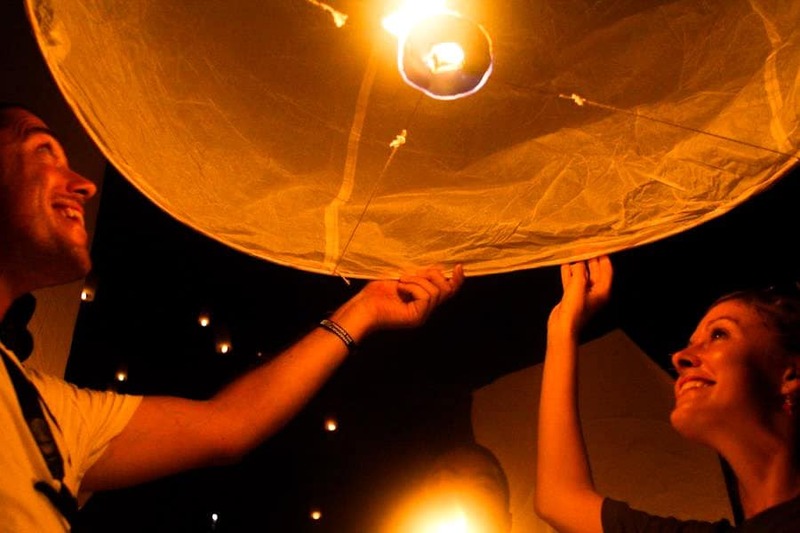 Each year, usually in November, many thousands of lanterns are launched into the air around northern Thailand as part of a long-standing Buddhist tradition. The biggest of these releases happens near the university at Mae Jo, a small town outside Chiang Mai. Of course, having no idea this was happening, I had booked my onward flight to coincide with the start of the festival. Last year Yi Peng was early in the month. 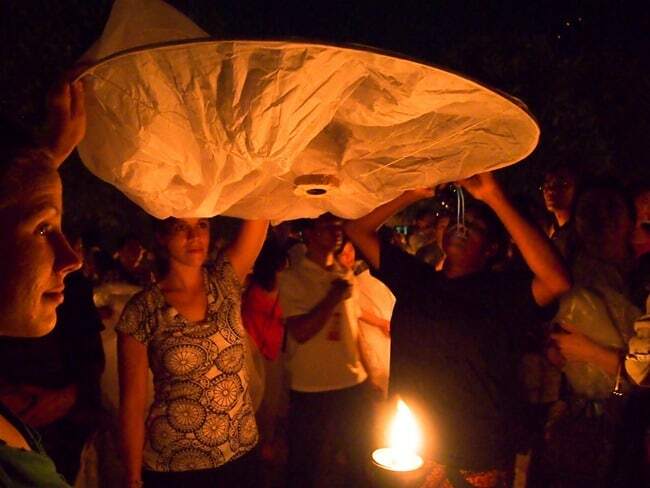 I couldn’t quite finish up in Australia in time to make it for the lantern release, missing it by a matter of days. This time, no matter what it took, I was going to be there to experience the event for myself. I’m happy to say that it easily exceeded my expectations. It was simply magical, and one of the most incredible things I have ever been a part of. After arriving early to beat the crowds, our group found a likely-looking spot and settled in. The better prepared (ie, not us) bought picnic blankets, plenty of snacks, even books and crossword puzzles to stay entertained until the ceremony began a few hours later. We had a packet of potato chips, a bottle of water and a million ants to keep us company. Hmm. Still, there was plenty of food from the vendors just outside the grounds so starvation was unlikely. 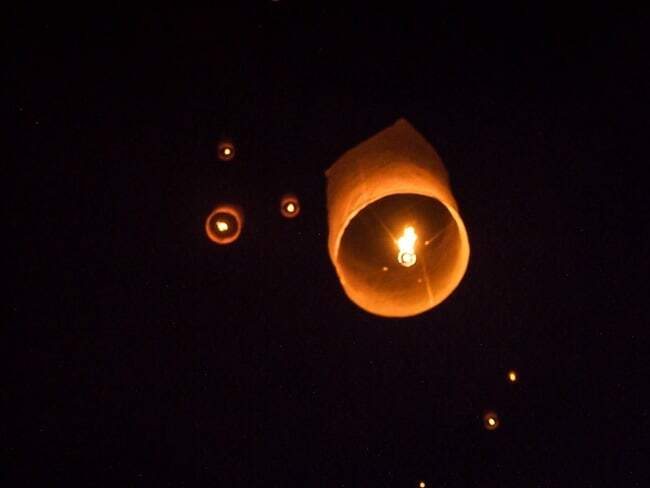 As night started to fall, the first few lanterns started to drift up above the tree line. The rhythmic chanting and movement of the monks on stage during the two hour ceremony was mesmerising, broken up only by the occasional crackle of fireworks or loud mobile phone conversation. Suddenly, with an announcement over the loudspeakers and a blaze of coloured smoke, the moment had arrived. 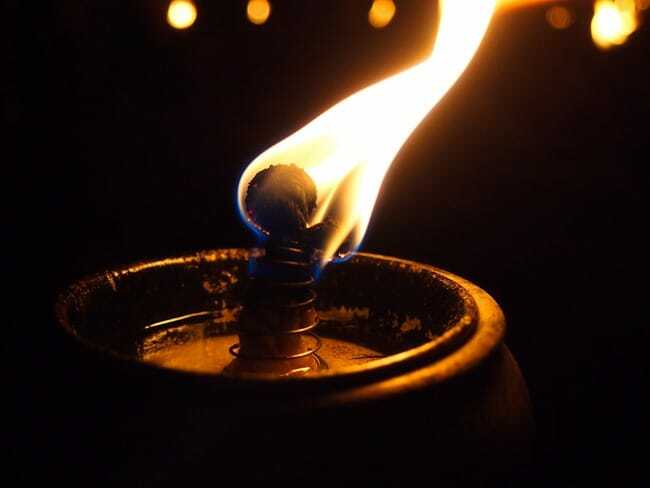 We lit the nearby candle and waited for our cue. 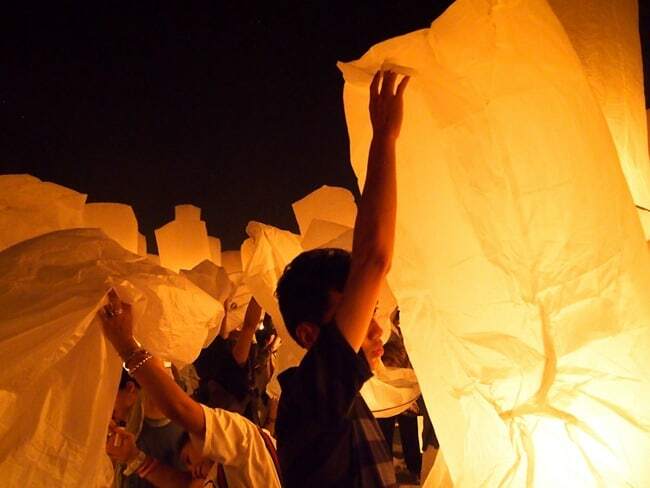 With a rustle of paper and a buzz of excitement, lanterns were unfurled everywhere. 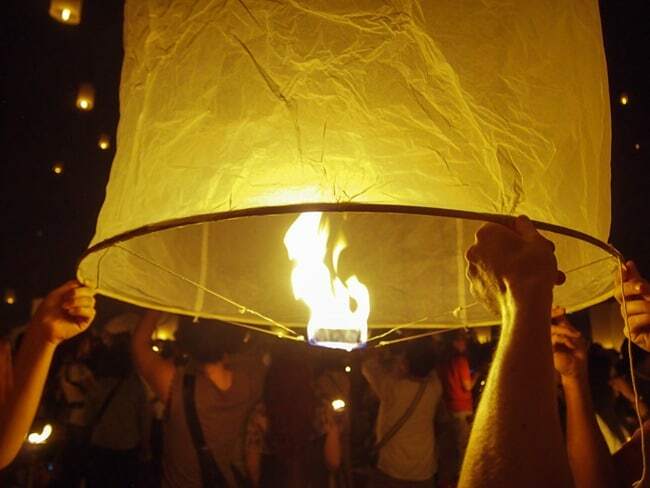 The khom loi are large and unwieldy, and needed at least two people to manhandle into position above the candles. Carefully arranging the paper so that the fuel cell at the bottom caught fire without sending the rest of the lantern up in an inferno took a bit of effort. Still, somehow, everyone in our party managed it without even a minor burn. 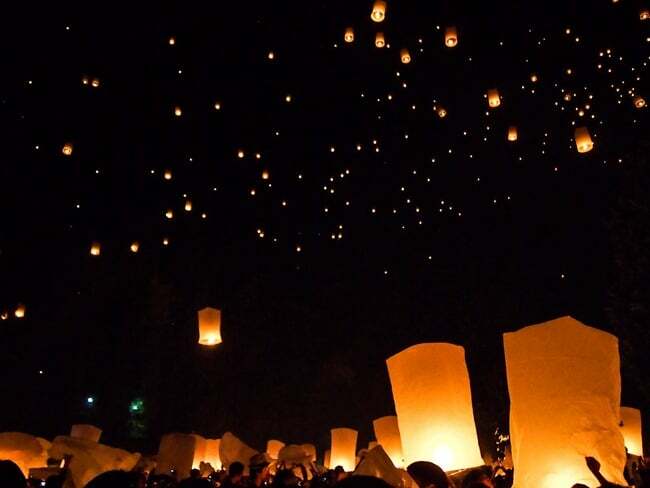 Although many people seemed to have developed selective deafness and let their lanterns go early, most of the crowd still managed to release in sync, sending their wishes flaming into the night sky. With huge smiles and silent prayers, Lauren and I let our lantern drift upwards to join the thousands of others floating far above our heads. Soon the darkness was filled with one of the most amazing things I have ever seen. I had jealously looked at photos of the event for the last two years, but being there was a hundred times better than any picture. 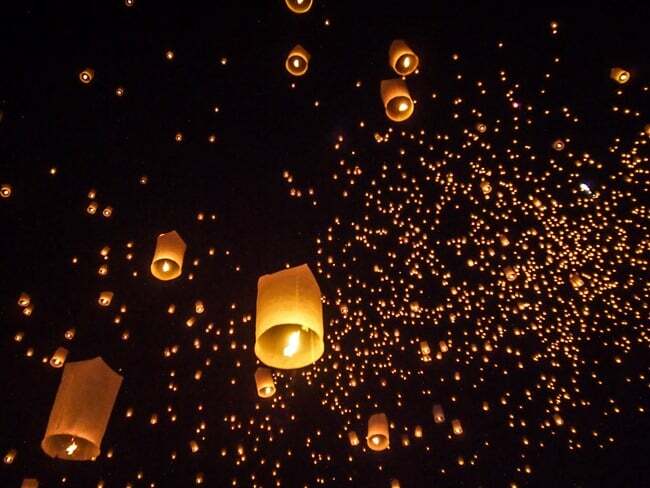 The shared excitement and happiness was indescribable, the flickering glow of ten thousand flying lanterns reflected on the upturned faces of the earthbound crowd below. 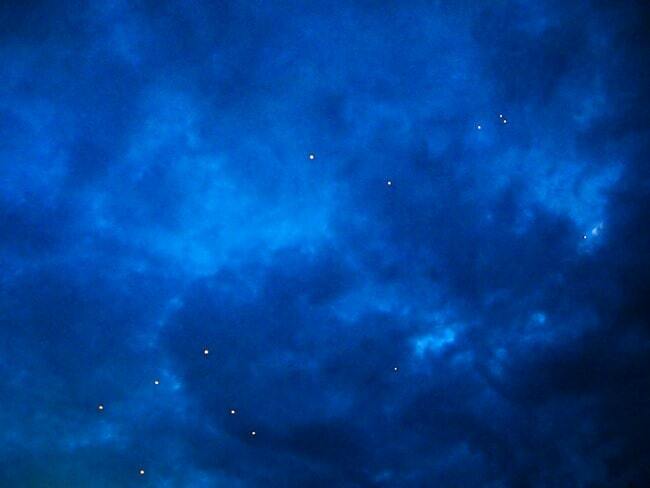 Stretching in a vast line above the university, the lanterns seemed to cluster together as they climbed. I’ve heard them compared to jellyfish in the past, winking, wriggling spots of light in the darkness. While I can see the similarities, for me there is nothing else that comes close to those first few minutes. People are regularly moved to tears by the experience, and it’s not hard to see why. Our good friend Shawna snapped this last picture of us, a few seconds before we sent our lantern skywards. I think the expressions on our faces says it all. We spent several hours being bitten by ants in the heat, got caught in a sudden thunderstorm as we left the grounds and took two hours to get home due to the rain and traffic jams … and would do it all again tomorrow in a heartbeat. 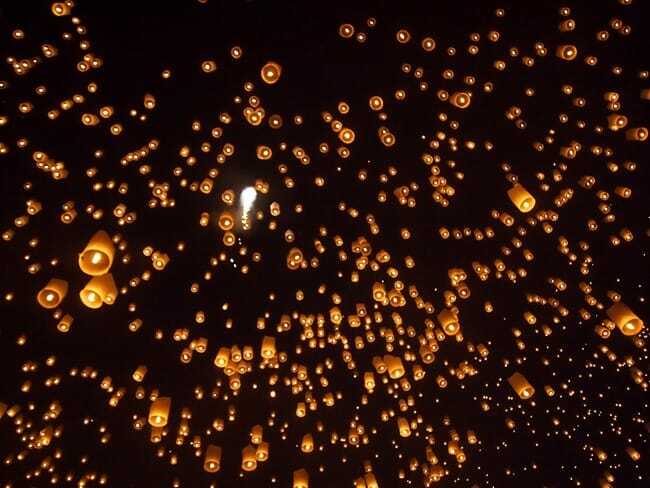 The Mae Jo lantern release was one of the most beautiful things that I have ever had the privilege of being a part of. Being able to share it with so many good friends turned an amazing day into a perfect one. It was, quite simply, magic. I really love the last pictures of you and Lauren smiling happily! 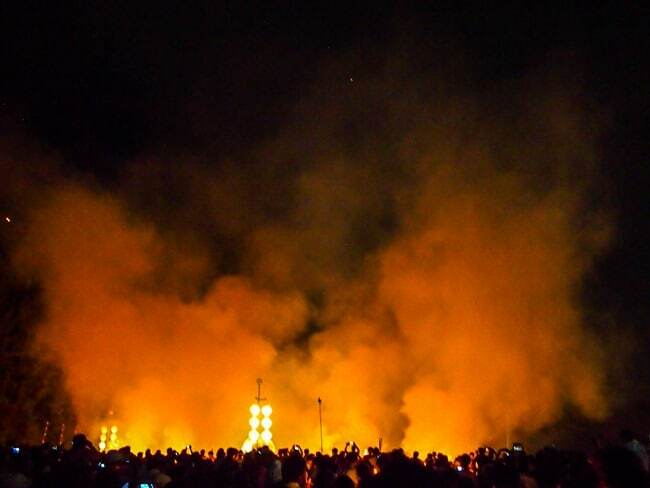 dude that looks epic – so gutted I couldn’t make it this year! ahhh well there’s always the next one…! Wow, this looks absolutely incredible. 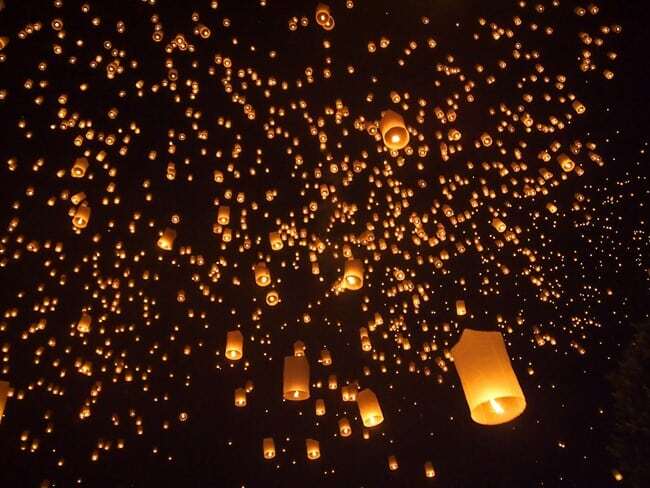 I’m very tempted to fly all the way to Thailand just to be able to do this next year! And just think, there are so many other reasons to fly out here as well! I have watched every year from afar and hope one day to be there in person also. It certainly LOOKS magical. Hopefully one day I can make it there myself! This is beautiful. I love lantern festivals and their sentiment. I think “jellyfish” is a fairly apt comparison. And glad you enjoyed it. Fun times! So so beautiful! I finish teaching in Thailand in October next year so I’m hoping I’ll still be around to go to this because it looks amazing! Yi Peng looks amazing! We missed it last year by only a few days as well, and looking at your pictures I think we HAVE TO make it to Yi Peng next year. It is so beautiful! 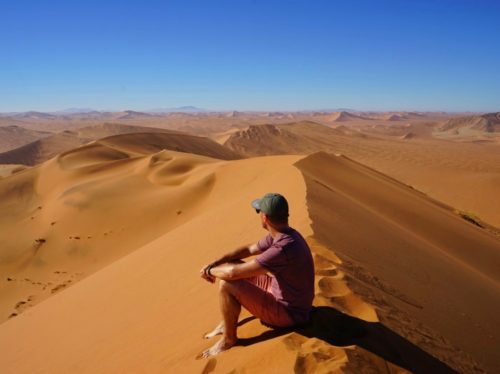 It looks like an incredible experience – awesome photos! Glad it lived up to the hype. This is so on our bucket list. This has to be the most amazing experience ever!!! Can’t wait to be there part of one. The pictures are really good man! It’s like you’re making new stars! Gorgeous! I’ve seen pictures of this before and it is definitely on my list. Looks like I might actually make it for 2013. This is most definitely going on my bucket list! I usually avoid events with too many people, but I think I might break this rule for this event. Spectacular! I like Shaun’s comment that it looks like you are making stars and love the last picture. This is yet another item on my ever-expanding bucket list. We seem to have similar tastes in travel! Always enjoy reading about yours. Cheers. 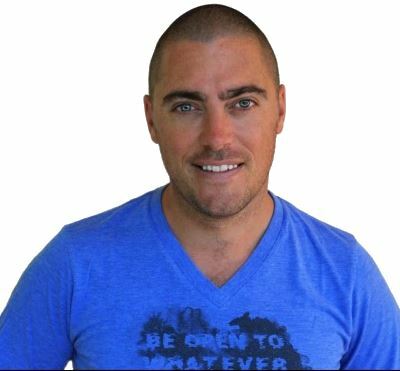 Thanks for sharing Dave…love your work! 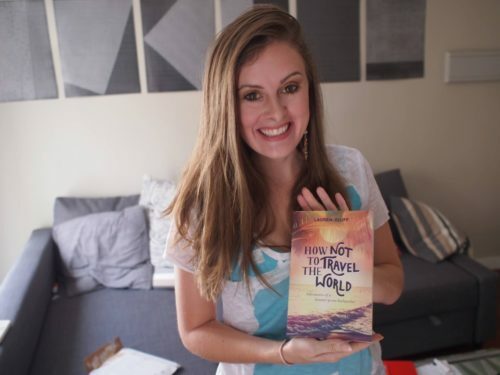 Photos look great and the story really puts you there! Beautiful and it has now made it’s way to my bucket list! How do I find out the date for 2013? I will be in Thailand during Yi Peng (Mid November 2013), but I can only find the dates for the oficial festivities and not for the lantern release at Mae Joe. Yi Peng is based on the lunar calendar, so the date changes each year. The date for the Mae Jo release is only announced a few weeks in advance, so there’s little point looking for it until much later in the year. You could assume it’s within a week of the official festivities, but exactly when I couldn’t say. Great photo’s! This is definitely on our to do list when we leave to travel Asia in August. Looks an amazing experience! Is this the free event that you went to? Or the paid one at yipenglanna.net? Thanks. The free one – in my opinion the other one is overpriced and, being put on entirely for tourists, not really the experience I was looking for. Thanks Dave. Do you know the date for the free event this year? Multiple sources have referred me to the paid one. I know the Loi Krathong is Nov 17 this year, but not sure if this event will be on that same day. Thank you. Yeah, I think the reason that you keep getting referred to the paid one is that it’s the only one that has dates announced well in advance. 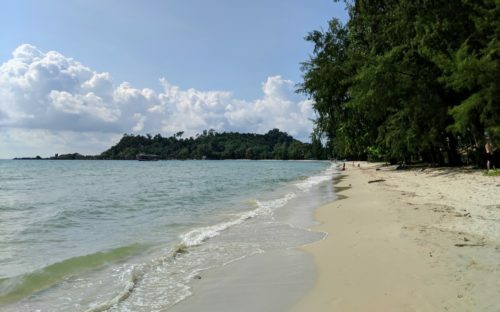 It’s probably about this time of year that dates are finalised for the free festival, but I haven’t looked into it this year as I’m not in SE Asia at the moment. 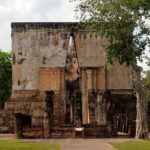 Your best bet would be to find a couple of Chiang Mai forums or Facebook groups and take a look there – if you don’t find the answer, perhaps just ask in those groups. People who are living in CM at the moment would be best placed to know when the official date is. Gives me butterflies to think about it! My wife and I will be there. Hope to see you there. My friends and I will be there for the festival this year!! But we’re having trouble figuring out if we need to buy tickets? 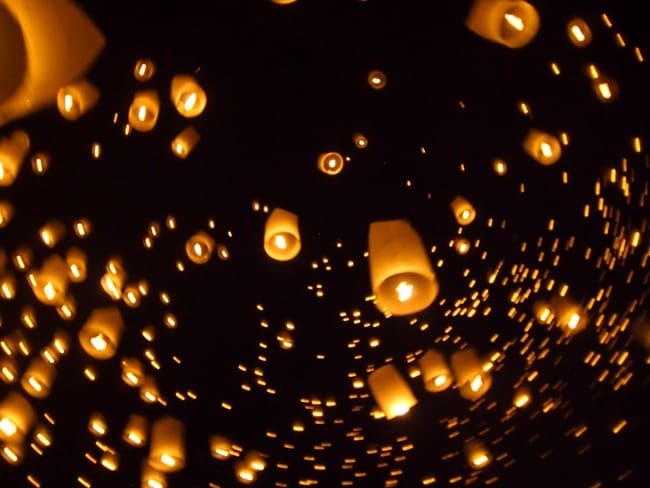 Or if we can just purchase entrance + lanterns on site? If anyone has info that would be amazing!! (And if we do need to buy tickets in advance, any ideas/websites of where to get them would be incredibly helpful.) Thanks so much!! Hi! 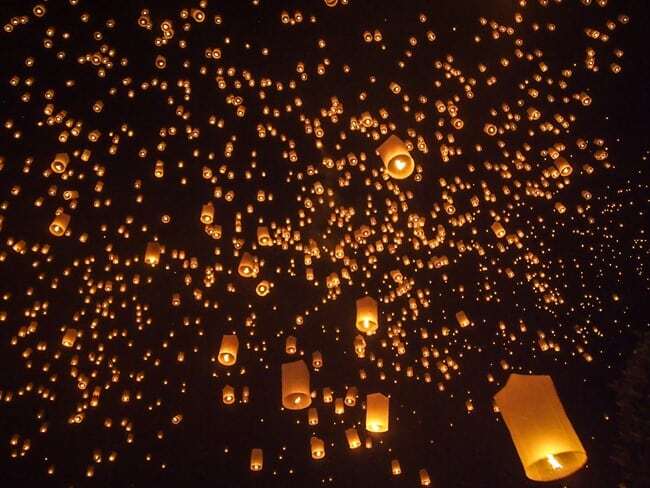 Where can I buy tickets for the Yi Peng Lantern Festival 2016? Not sure, I’m afraid. When I went, no tickets were required for the local celebration. 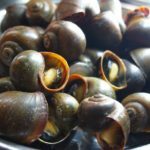 I believe that as the event has become more popular, things have changed in that regard, but I haven’t been back to Yi Peng in recent years to know the details.